Phillip Bannister, Vice President Delta Electric Inc.
Phillip Bannister brings years of experience in the mining industry. Phil capitalizes on his degree in Electronic Engineering in his executive role with Delta Electric, a company he first began working for in 1985 as a student from Logan High. 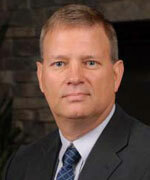 Phillip has been a dedicated leader at Delta Electric since he returned to West Virginia in 1995. He has been married to his wife, Becky for 12 years and they have 3 daughters: Grace, Faith, and Hope.